Collingwood was left to rue missed opportunities as it fell to Box Hill at Box Hill City Oval on Sunday. 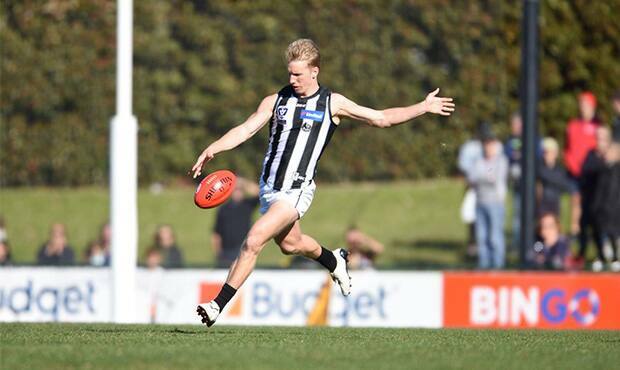 The Magpies had fought back from a three-quarter time deficit to lead entering time-on in the final term. But two goals late for the Hawks against the run of play meant that the Pies were left to wonder what could have been. Coach Jared Rivers said that Box Hill’s ability to make the most of its periods of dominance proved the difference between the two sides. “We felt were in control for large parts of the game,” Rivers said to Collingwood Media post-match. “There were ten minutes in that third quarter that let us down a bit, we coughed up a couple of easy goals. “Late we had a lot of opportunities going inside our forward-50, we just couldn’t capitalise. The loss dealt a blow to Collingwood’s top-four aspirations. The Pies are now a game behind Box Hill and Williamstown in the hunt for fourth spot with just three rounds to play. The Pies will likely have to win all of its remaining three matches to be in with a realistic chance of earning the double chance. Rivers is confident that his side will remain in the hunt until the very end of the home and away season. “We’ve got three crucial games coming up, with Port next week then Frankston and Sandy (Sandringham) to finish up,” Rivers said. “It’s (a top-four finish) still there for us, we’ve just got to keep winning. “This one really hurts because we were level with Box Hill, it was an important one to win. Next week, the Pies travel to face the reigning premiers in Port Melbourne. The Borough sit level with the Pies on 36 points, so will be equally hungry to keep their top-four chances alive. The match begins at 2pm next Saturday afternoon from North Port Oval and will be broadcast live on Channel Seven. Alex Woodward impressed against his former side.